Village is a tremendously sinister game, where sinister people do sinister things under the sinister shadow of the sinister church. It’s a good game though, and we gave it three and a half stars to recognise that. The reaper’s scythe comes for us all eventually and sometimes it’s fun to direct it somewhere productive for once. That’s what Village lets us do. Death is a weapon we wield for the duration of its gameplay. Do you fancy having the power of life over a hapless village full of desperate souls? Well, let’s see if Village needs to end up buried in an unmarked grave of its own for crimes against accessibility. Take a cube. Put it in the bag. Take another cube. Put it in the bag. Knowledge is power. Or persuasion. Or faith? It’s hard to tell. The colour choices here overlap, with green and brown being particularly problematic for those with Protanopia or Deuteronopia. Pink and orange is a problem for Tritanopia. Monochromancy will, of course, have a problem with all of these. The cubes represent resources of particular types, so they aren’t interchangeable and will cause problems whenever a cube is expected as part of a reward or cost in the rest of the game. 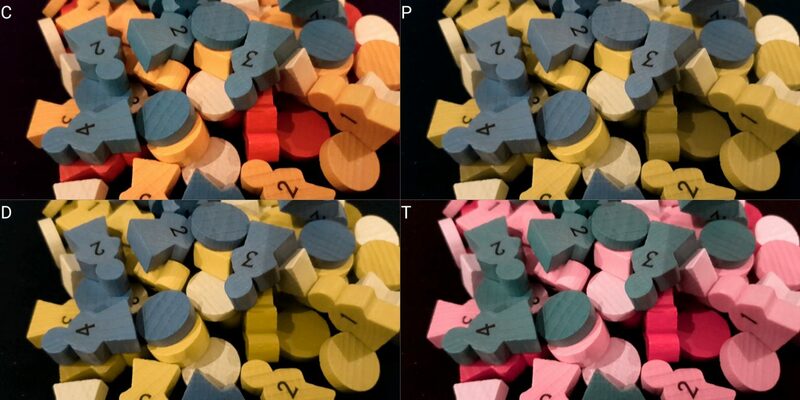 The meeples could be better too, but they are at least broadly distinguishable even if there may be occasional confusion, especially when poor lighting setups are brought into the picture. So, it’s not a great choice of colours, but our real concern here is whether or not that interferes with play. It does, but it perhaps doesn’t make play impossible provided players don’t mind querying what the cubes available are in an area. The actions will, over time, become mostly internalised because of the way the coloured cubes map onto sphere of influence. Green represents persuasiveness, brown represents faith, orange represents skill, and pink represents knowledge. So, if you want to advance in the council you need green. To enter the church you need brown. To craft, you need orange and pink. Knowing this without reference to the board will come with experience, and provided someone doesn’t mind pretty constantly querying someone else for which cube is which, the game is still likely to be playable. At a cost. At, let’s be honest, a probably infeasible cost. 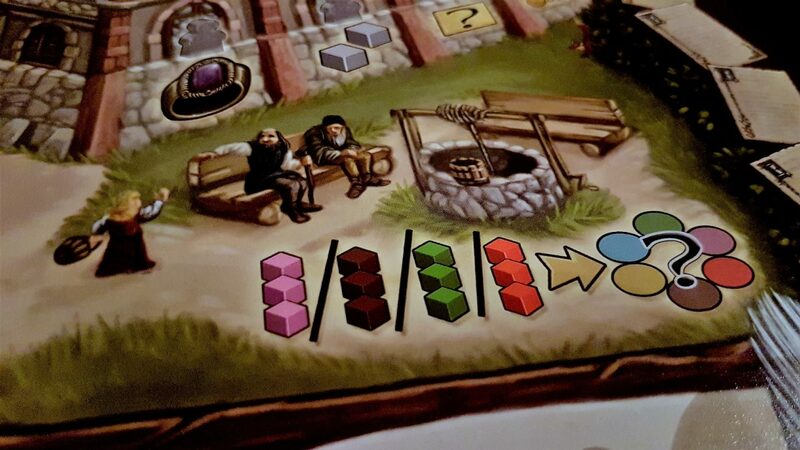 Cube management then is an issue, but a disciplined approach to play will aid in this – having each cube kept in a particular area will allow an at a glance look at the distribution of resources. So really, it all comes down to other players keeping you right as to your options at a particular action square. It’s very cumbersome, awkward and annoying but not technically game destroying. We’ll very, very tentatively recommend Village in this category. It’s worth pointing out here when I mentioned this was the next teardown that we’d publish I got a number of Twitter comments guessing essentially ‘You’re going to kick it to death in the colour blind category’. That in the end is probably a better guide in this section than my own comments. Now, the rafters show the victory points earned, the windows show nothing, and the alcoves between windows show the grain cost to progress. The crafting section shows multiple routes to access the resources, either through the bifurcated time system (time to train, and then time to produce) or resources. Similarly, the colour codes associated with the professions (as used in the book of remembrance) can be difficult to see, especially when dealing with the very poor contrast of the church. There’s a brown shield on the roof there that shows into which category of the book priests go when they die. You’d be forgiven if you had difficulty seeing it. All of this though will get easier with familiarity – mostly this information is learnable, and the shorthand is there as an aide memoire. It doesn’t reflect moving elements of game state. However, other parts of the board do. The traveler track for example shows the location of travelers, and the cities visited will be covered with tokens adding in an obscuring element that must be moved out of the way to investigate rewards. These too will be stacked in a way that may obscure obvious state data as to where a player has already visited. Customers in the market show their victory point values and the goods they want, and these will be constantly shifting in response to market activities. The distribution of pieces in the book will have a huge impact on time management strategy, and the distribution of each player’s pieces and the generation to which they belong is critically important game information. This is reflected on the pieces with a small number that is not easily seen at a distance, at an angle, or under poor lighting conditions. Similarly, careful and strategic play needs you to know what the time implications are for other players, especially when it comes to selecting plague cubes or gathering up scarce resources. You might want to prioritise your collection of the resources that would permit someone to buy an ox if their need for one is such they’ll take the time penalty. 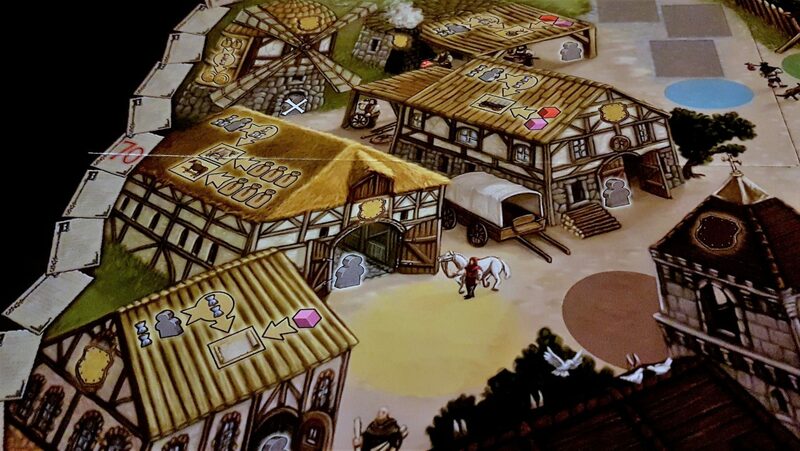 The map of Village is quite large, and the cubes distributed throughout are quite small – this is likely to add an additional difficulty to visually parsing the game environment. The goods tokens too all have the same form factor, and the difference between an ox and a horse may not be especially large for those with limited visual acuity. Coins and grain are meaningfully different, and both only come in a single denomination. 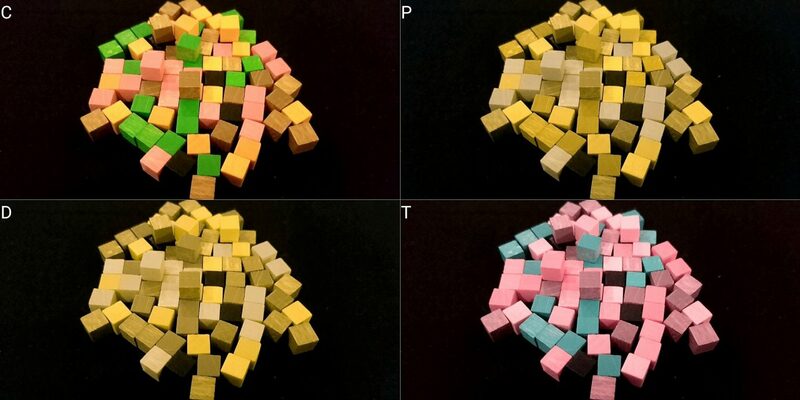 However, cubes are all identical except for colour, as are the meeples. Customer tiles too have relatively dense visual information presented across them. Our conclusion then is that the game is likely playable, with care, for those with minor visual impairments. However, the amount of referencing and cross-referencing that is likely to be required will add a considerable time and flow burden to play. As such, we don’t recommend Village in this category. The game has no required reading level, but does expect a certain degree of symbolic parsing to ease memory burden. The iconographic language used is somewhat consistent, but highly contextual as to how it’s expressed. A considerable degree of numeracy is needed for play too – not just in terms of the arithmetic of actions, but in terms of the balancing of probabilities, the ascertaining of risk, and the management of generations. A badly timed death can throw a considerable spanner in the most intricate works, and knowing how to properly manage the currency of time is critical. Game flow is rather complex too, ebbing and flowing with player choices and often with conditional exceptions and considerations. For example, placing a horsemonger (I know that’s not a real word) in the horsemongery (again) takes a total of six time to make a horse. For subsequent invocations, it takes three because the horsemonger is already trained up. Or, you can spend three bags of grain and no time to get the same thing. Or, for the same action, you can craft a scroll (two time to train, two to produce, or one pink cube). Or you could make a wagon (three time plus three time or an orange and a pink). Or you could turn two bags of grain into two coins. There are other choices too, all stemming off of the single craft area. The exact way you’ll want to handle the action will depend on situational information and the wrong choice can be extremely costly in the medium and long term. Triggering a market day gives the person that triggered it a free sale, but everyone else (including the person that triggered it) must pay a green and a unit of time for every subsequent sale. Triggering a harvest action awards two grain, unless you have a horse and plow (three grain) or an ox and plow (four grain), and only works if you have someone on the farm for the action. When all the action cubes are removed from a location, it can’t be triggered again unless someone takes the well action – that permits the exchange of three cubes of one colour to take any game action. That is unless the last cube has been taken in which case that well action is not permitted. Taking a cube gets you that resource, unless it’s a black cube in which case it costs you time and goes back in the bag to be drawn again later. And so on, and so on. There’s a lot of this ‘if this then that except’ stuff in the Village rule-set. None of it by itself is complex. When it’s all taken into account though it can be complicated and confusing until the various systems are internalised. Added to this is the complexity of the game state itself. This is represented not only by diminishing opportunities but by generational placement of people; dispersal of resource cubes; availability of customers in the market; and the time counter for any given player. On top of this are all the goods available on the farm, and the grain, and any meeple that have been consigned to the black bag for a later Mass. Village is a game of picking your moment, and handling the delta of mortality in a strategic way. Those things put a considerable burden on both fluid intelligence and memory. The Mass too decouples the action (put one of your meeple in a bag) and the outcome (maybe get a chance to progress them through the church). Guaranteeing a return on that investment requires a gold coin for each family member in there. That in turn needs the player, at the end of the round, to have that currency in place. Similarly for advancing priests through the ranks – the process and timing of this is decoupled from the progression of the rest of the game and requires grain to be ready to handle the payments. Are they tithes? Or is it flat out bribery? Who knows? Whatever it is, you better have the goods for when you want to improve the position of your priests. There is a lot to keep track of, and while none of it is especially inter-related in terms of mechanics there is a situational synergy that comes from assessing the current value of the action in light of the wider context of play. As such, we don’t recommend Village in either category of cognitive accessibility. There’s just too much to do, too much you need to track, and too many ways you can screw up. Leaving aside (for now) the grim theme of opportunistic bereavement, there isn’t a lot to get worked up about in Village. We mentioned in the review that it’s not an especially exciting game, and that’s true for both enthusiasm and upset. The competition in Village is at one level removed – you compete over an allocation of actions rather than directly in farm to farm warfare. There’s a generous allocation of these actions available in each game, meaning that unless you go last and everyone wants the same thing, you’ll probably get a swing at the bat. Even if you don’t, there are ways and means to adjust the odds in your favour – either through making use of the well action, or lining up council membership so you can take the first player marker when it’s opportune. Being locked out of a desired path is rarely permanent, and there are always meaningful things you can do with your turns. You don’t even have to act, so if you want to pick up resources without performing the associated action that’s entirely fine. The only risk is that if you’re scooped on a desired course of action you might find yourself having to take plague cubes for sub-optimal activities. Timely death though is as valuable to progress as a life well lived. This collegiality extend through to the basic design sensibilities – there’s no player elimination, and no explicit ‘take that’ mechanics. It’s possible for players to gang up to deny some opportunities, but it’s not possible to gang up and deny all opportunities. There’s always something you can do to improve your lot in life. If they’re blocking the council, go traveling. If they’re hogging all the marriage spots, focus on resource acquisition. If they’re dominating the church, turn your attention to commerce. A specific path can be blocked off, at least temporarily and ineffectively, but progress can never be denied. It’s very sedate. Indeed, it’s borderline soporific at times. That brings us to the only real concern here – the constant reinforcement of mortality throughout every element of the game. This is likely to be a somewhat troublesome element for certain categories of emotional distress, and also as a general worry for anyone that suffers from death anxiety. Village doesn’t allow you to skirt over this – it’s not like a dungeon crawler where you kill enemies but never dwell on it. Village has a graveyard right there on the board. It has a book of remembrance that you’ll constantly be manipulating. It’s light and morbidly comic enough that it’s unlikely to unduly concern anyone that doesn’t live with a perpetual apprehension of their own death. However, it does set the stage for exacerbating personal contemplation and reflection on the topic. It’s not that the theme is a problem as such, but rather that for certain mind-sets it might be a trigger for a spiral of anxiety or dread. It’s something to consider before adopting it for your group, although overall we’re prepared to recommend the game. Village does not lend itself well to direct physical interaction if fine motor control is an issue. There’s a lot of picking up cubes; distributing family members; drawing cubes and supplicants to the church from bags; and moving various family members around the map. The time tracker and the grain on your farm too are easily disturbed because the board is small and needs regularly manipulated. The number of cubes that you’ll have there too, as well as in each of the action spaces, might be substantial. 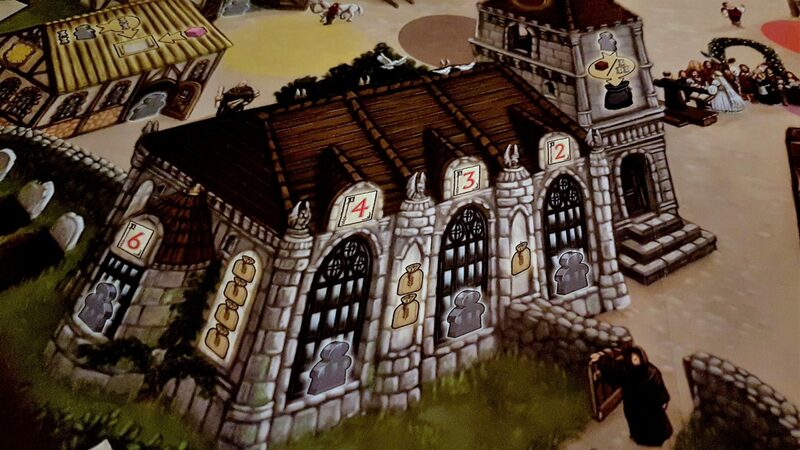 In a four player game, the craft quarter will have seven cubes and the nearby church will have three. That’s a lot of small tokens in a relatively tight area. 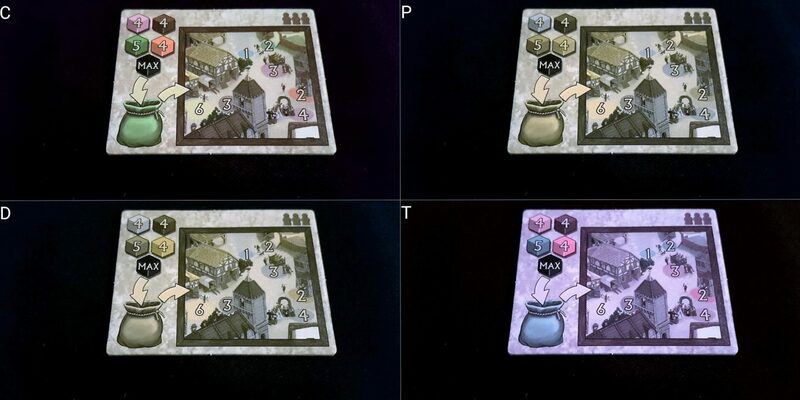 However, while there is a fair amount of token collection and distribution, and the map is quite large, there’s no reason you couldn’t adopt more accessible variants, such as coloured bowls for each space. There are ways that the game could be made more playable if agency is important. However, it does lend itself well to verbalisation since you can always precisely explain the action you want to undertake. ‘Take a pink cube from the craft quarter, and place my second generation meeple in the horsemongery for six time, and give me the horse’. There is no situation, other than perhaps travelling, where it is not possible to easily articulate an instruction. For travelling, there’s no specific naming or co-ordinate system for the journey but every location has at most three connections and there is an explicit directionality. ‘Leave east, heading to the gold city’. Overall then, we’re prepared, just, to recommend Village in this category. The box shows many more men than women, although the single woman on the front is prominent. The artwork of the map shows a number of women dotted around. There’s one heading to the well for water (where we also see a pair of older gentlemen, which is nice). They’re in the crowd in the village square. They’re on the farm boards that each player gets. There aren’t a lot of them though, and aside from the bride they’re not given starring roles. The craft quarter is a place for men, as is the church. The marketplace is full of customers, all of whom are men. The shop stalls are all staffed by men. The councillors are men. It’s reigning men. 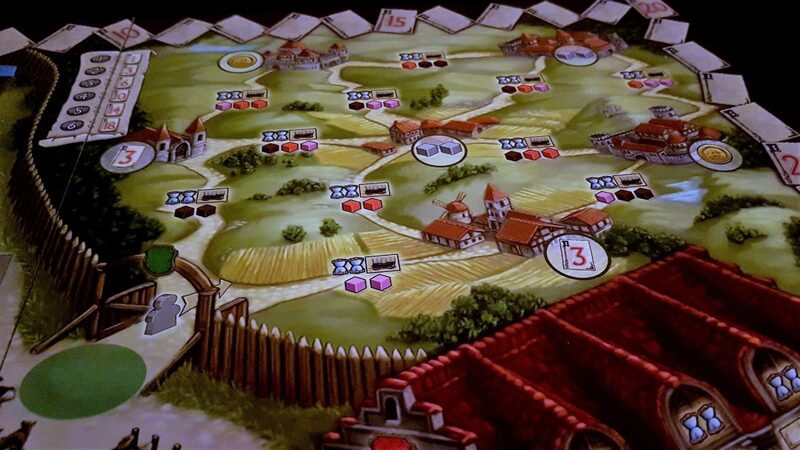 All of this is perfectly in keeping with a rural, presumably medieval village – and Village does very tightly integrate its theme into gameplay. However, there’s no reason it couldn’t have done a better job with the gender balance than it does. The village is never given a particular space and time (although the presence of the Catholic Church is a telling piece of evidence) and nothing would have been lost with a little more inclusiveness. Even as background characters, the women here are represented only incidentally. The manual though adopts a gender neutral tone, which is good – and even in the examples there is a gender mix of exemplar players (Phillip, Peter and Martina). Other than that, aside from a couple of inherently heteronormative game mechanics (marriage instantly spawns off a new person, for example) there is little about the theme that is expressly humanised. It’s mostly a game of interacting mechanisms rather than social representation. At an RRP of £35 it’s a relatively pricey title, and with a maximum of four players it can be a slightly troublesome prospect for larger families or game nights. There is an expansion that would bring it up to a meatier five, although that adds another fifteen or twenty pounds onto the cost. The base game though works well at all the levels it supports, so it does scale down to pairs and triples easily. Overall, we recommend Village in this category. No communication is required for play. You can sit quietly and meditate upon your own inevitable death as you consign your family members to the grave. This too shall pass. We strongly recommend Village in this category. The initial setup of the first game is massive pain in the backside for a range of accessibility categories. 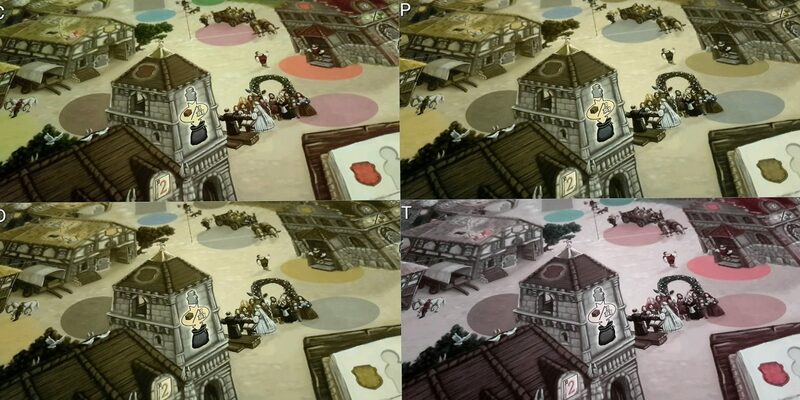 It requires careful application of small stickers to dozens of meeple, one on each side. That is going to be a problem when considering physical and visual impairments. It’s slow and frustrating work too, although once you’re in the groove it’s as potentially Zen as any other mindless activity. However, the target area for the stickers is small and mistakes are easy to make. This is a problem only once during the life of the game, but it’s going to need someone to do all the sticker work. The shorthand that is expressed across the various buildings is great for reducing the cognitive burden on remembering what each building can do – at least, once you’ve mastered it. However, if visual impairments are combined with cognitive impairments this is going to put an extra burden on memory in an already burdensome game. We don’t recommend the game for those with cognitive or visual accessibility considerations, but this would be enough to strengthen our advice to ‘definitely avoid the game’. 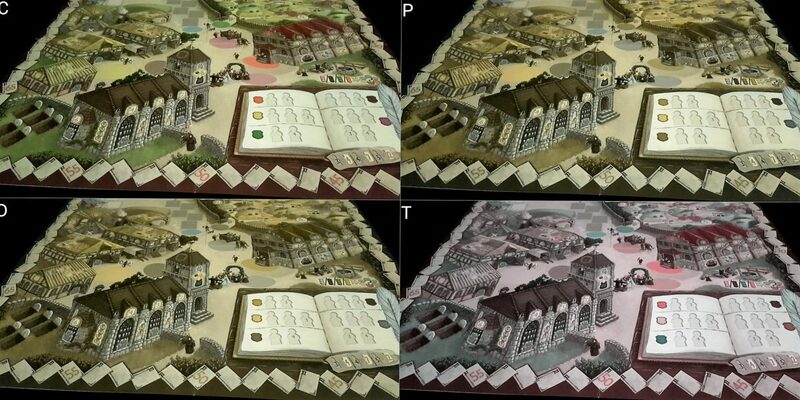 Visual impairments are already a considerable issue when dealing with interpreting the game state, but if this is combined with colour blindness one of the few useful visual aids will be lost – our recommendation for the colour blindness category would instead become a strong suggestion you avoid the game. Our suggestion that the game is probably just playable with care would become ‘very unlikely to be satisfying to play’. The verbalisation strategy needed for certain kinds of physical impairment is going to become a critical problem if paired with a communication impairment, or if such an impairment is present in the player expected to do the physical manipulation. As is often the case with such intersections, this would be enough to render the game fully inaccessible. The game lasts around 20-30 minutes per player, with the death mechanic offering considerable opportunity for manipulating the duration should physical, emotional or cognitive discomfort become an issue. If a player should drop out, play can continue largely uninterrupted with other players simply progressing with their turns as usual. This might lead to the absent player taking up lucrative spaces in the council or church without risk of death, but they can easily be returned to the farm if that’s likely to be a problem. As such, while the game doesn’t have a graceful, formal mechanic for adapting to changing player counts it’s relatively easy to come up with an effective house-rule that would deal with the situation. As is often the case, Village is a mix of good and bad. There are a lot of moving parts, a lot of choices to make, and a theme that while darkly comic is also potentially a trigger for emotional spirals of depressed morbidity. Despite this, the limited and light competition offers a generally accessible model of emotional interaction, and with the aid of verbalisation it’s likely to be fully accessible to all categories of physical impairment. There’s just so much going on in the game though, and so many options that need careful consideration, for it to thrive in many other accessibility categories. 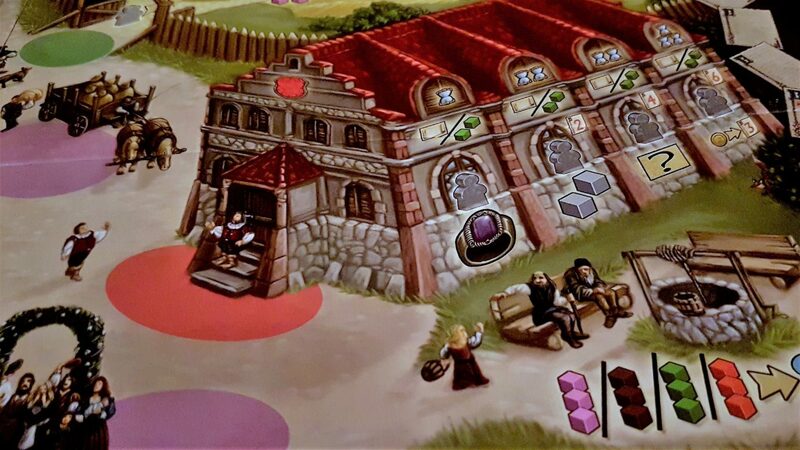 We consider Village to be a good game – an obviously clever design that incorporates a number of genuinely innovative mechanics. However, those systems tend not to cohere in any deep or meaningful way, leaving it feel ultimately rather samey. 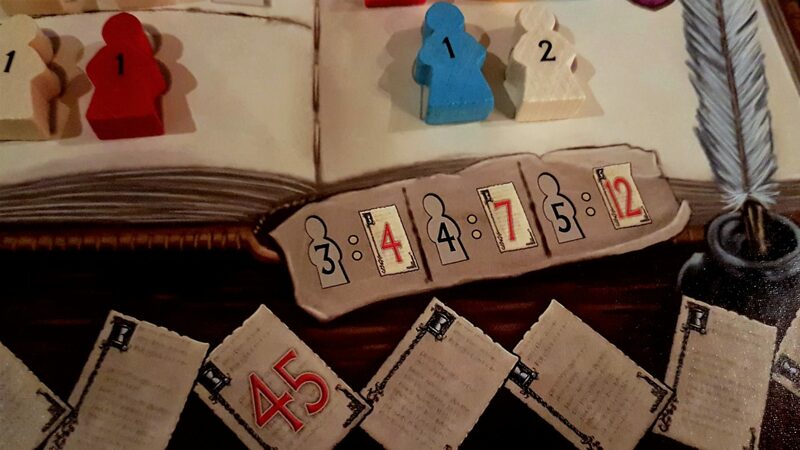 We gave it three and a half stars in our review, but since it’s a Kennerspiel winner you can likely ignore our thoughts entirely and put your trust in the Spiel des Jahres judges. If you do, hopefully you can play it if only for the fleeting joy that comes from murdering your family without risking a custodial sentence.